Hey guys, nice to see the Conclave back once again. Hierophant - Character still to be determined. Thanks for watching, guys! 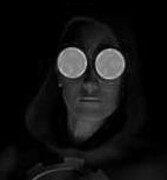 You can follow the project at the INQ28 blog. If you'd like to have your own INQ28 models featured, just get in touch! I think it'd be great. 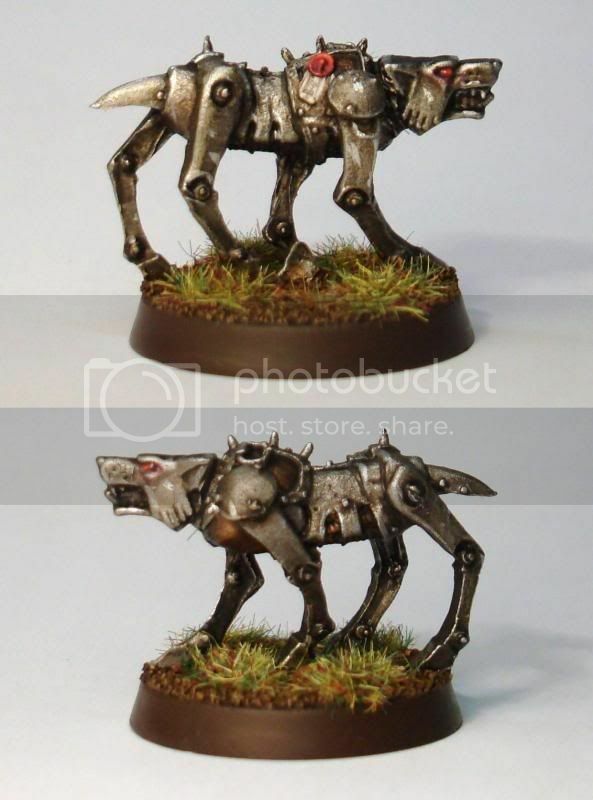 Some very subtle and effective conversions. I rather fancy doing that Hierophant with a flamer or heavy flamer at some point (although he's OOP now and sells for silly money on eBay). That's one of the nicest paintjobs I've seen on that bounty hunter, too: I don't, as a rule, rate that mini much but you've made him look better - perhaps - than he deserves. I saw the old clave log and earlier bitz of the warseer log but havent seen any painted I dont think. Mourn is a personal favourite, up with Seraphael which is excellent, what bits did you use? ...wouldn't expect less from the Illumininatus moderator of course. I'm not sure Molotov is actually an artist, in any more than miniature painting. In many ways, that just makes his extreme dedication to Illuminatus all the more impressive, and my lack of it all the less so. I'll tell you this though - there is no way I can paint that well. Serious respect. Hey guys, thanks for all the comments - they're seriously appreciated. I do have to make it clear before it gets out of hand that I'm not painting these particular models. I converted them up (all of them except the Hierophant, at least) and sent them off to Steve "El_Diablo" Day, a friend of mine. Foolishly, I didn't take pictures of all them before I sent them off, so I'm having to post them in dribs-and-drabs as he works his way through them. Our INQ28 project is collaborative - I suggest painting ideas, but ultimately he's the one who deserves the credit. 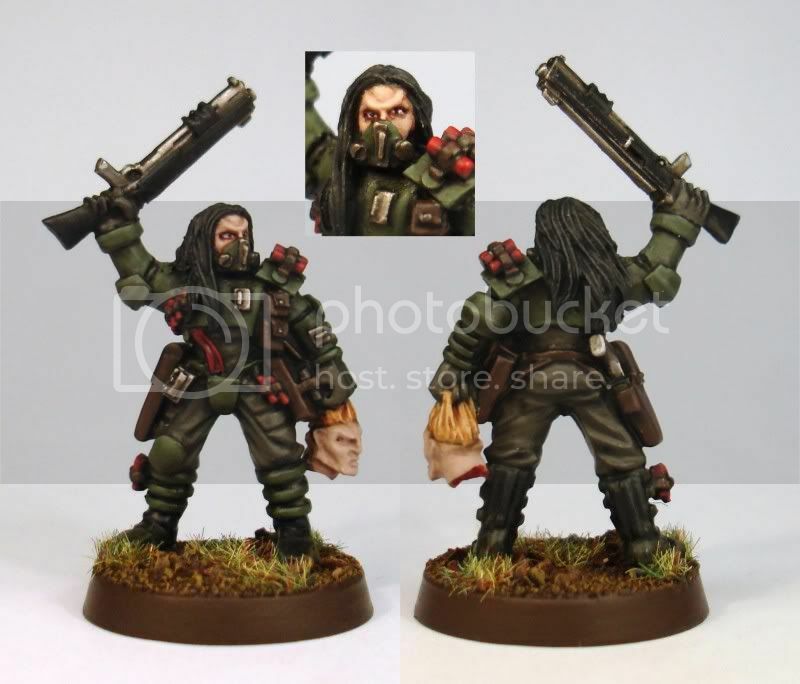 I'll gladly take kudos for the conversions, but Steve's the (very capable) painter in this case. Hopefully conversion can count as "art"...? PO: Thanks for your comments in particular. The idea of converting that Hierophant with a flamer is one that's sparked all sorts of concepts in my mind. I may have to try it at some stage. 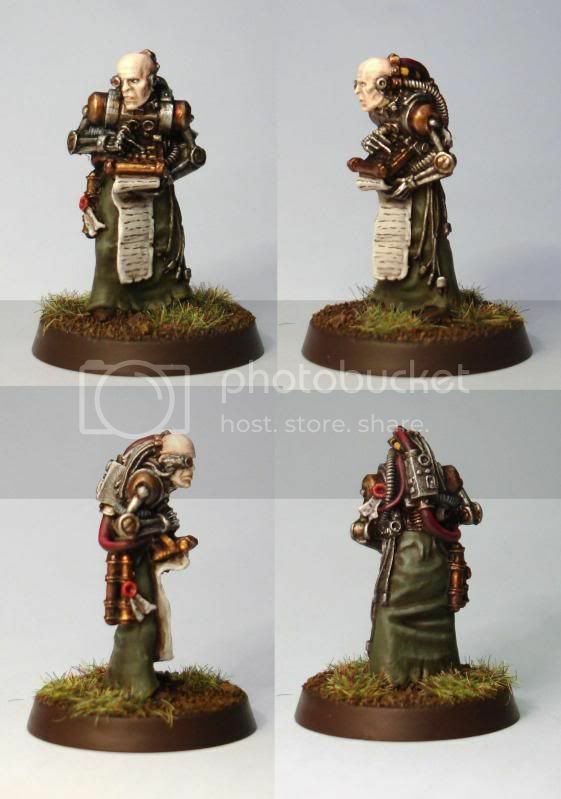 The Hierophant ranks among one of my favourite GW miniatures, and I think it's a shame they dropped it (and the fat sage) for seemingly no reason at all. I foolishly traded my model away years ago, but Steve maanged to find one in his bitzbox. It was missing its eviscerator blade, so he's replaced it with a plastic chaos chainsword blade. The Bounty Hunter is a bit of a problematic model. I know what you mean about the crazy paintjobs the model seems to attract! It's a model that's gone through a couple of stages as I converted it. 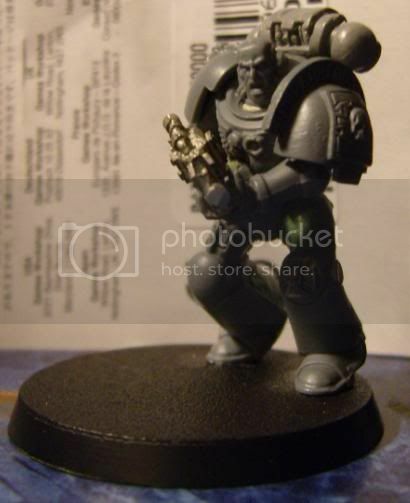 Firstly I removed the bolter/grenade launcher. 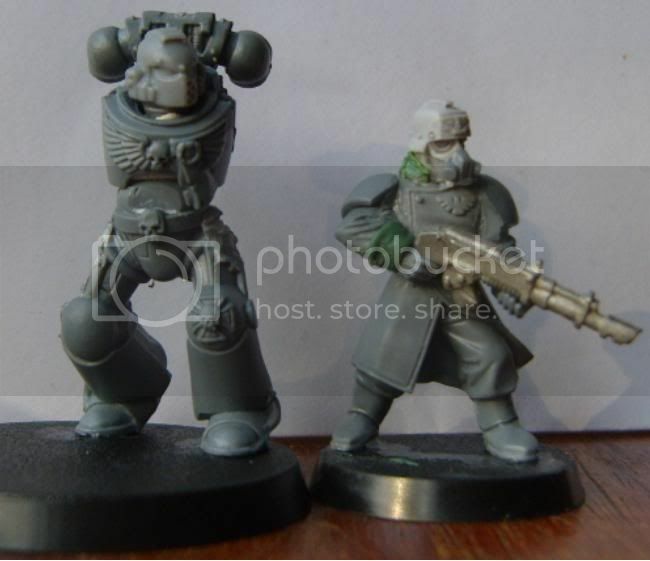 For a while he just had a laspistol, but I eventually went for the shotgun (converted from a new metal Goliath shotgun and a forgeworld shotgun) as it gave the model a better "shape". It also made it look like he was hefting a spear or a javelin, which served to heighten the subliminal comparisons between the model and the "Predator". Adam: Thanks for your comments. 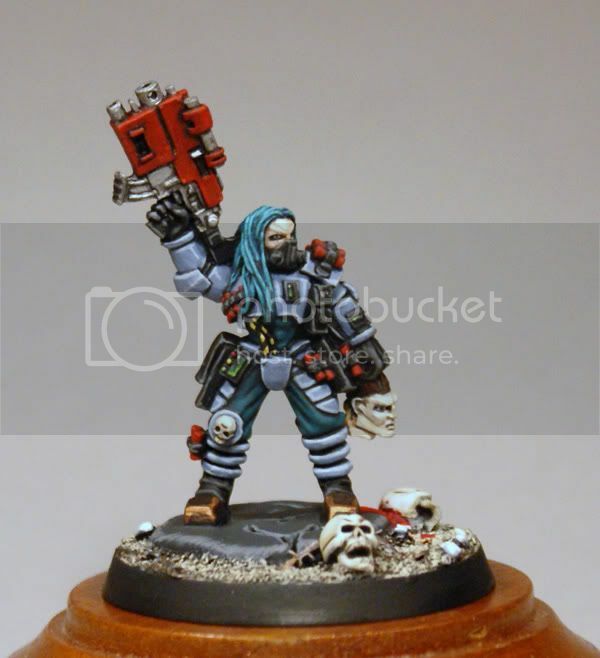 I addressed Mourn's parts for the most part with my response to Precinctomega, but to clarify: Fanatic's Necromunda Bounty Hunter with the hand from a multipart Goliath ganger's shotgun and a forgeworld resin shotgun. Seraphael is a normal Daemonhunters Daemonhost (this one) with the bits that offended me removed. His head was replaced with the Champion head from the fantasy Chaos Warriors (the sprouting horns beneath his skin was a nice touch, and he was easily changed from "shouting angrily" to "screaming in agony") whilst the outstretched arm was from a plastic zombie, with green-stuffed manacle. Marco: Thanks for the comment - no, I'm not an artist. I set up Illuminatus in conjunction with an artist (who has since had unavoidable work and RL commitments) but now I'm pretty much running it single-handedly. I am looking for artistically-inclined moderators to realise the site's potential though! Real life? What are these heretical mumblings? I am looking for artistically-inclined moderators to realise the site's potential though! I have moderated sites in the past - but I'm not sure that I've really been at Illuminatus long enough that I can really offer my services as such. I'll be back soon, I promise! Sorry for off-topicness. Well here's something on-topic: WIP painted pictures of Inquisitor Adorno! The first warband reaches completion. 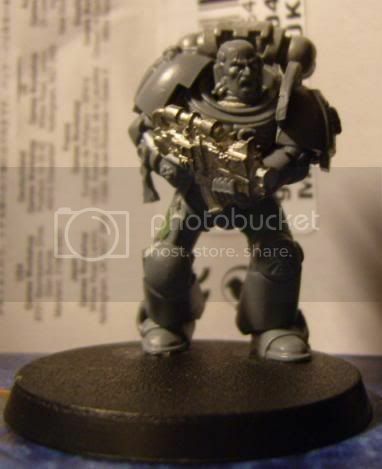 Adorno is the basic Solomon Lok model from Forgeworld, entirely unconverted. I think Simon Egan and Will Hayes did a great job with the model, and I knew I wanted to include it in some way. 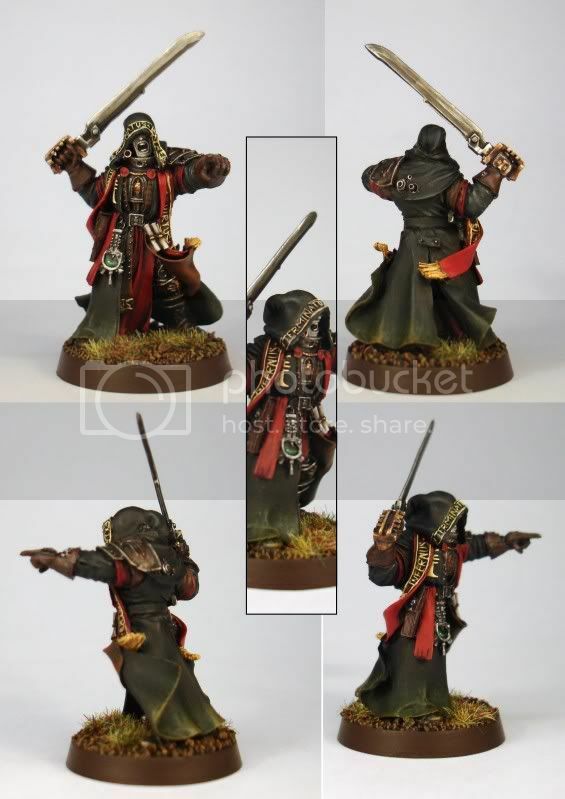 When we first started fiddling with INQ28 a couple of years ago, we used the Witch-hunter Crusader model as an Inquisitor - the robed look was entirely fitting, we thought. Solomon Lok's model continues that look. When Steve asked for painting guidance, my only real request was that he make the model "sinister" as opposed to the more "righteous" look of Solomon Lok, and that he have pale skin, the result of Seraphael possessing him. 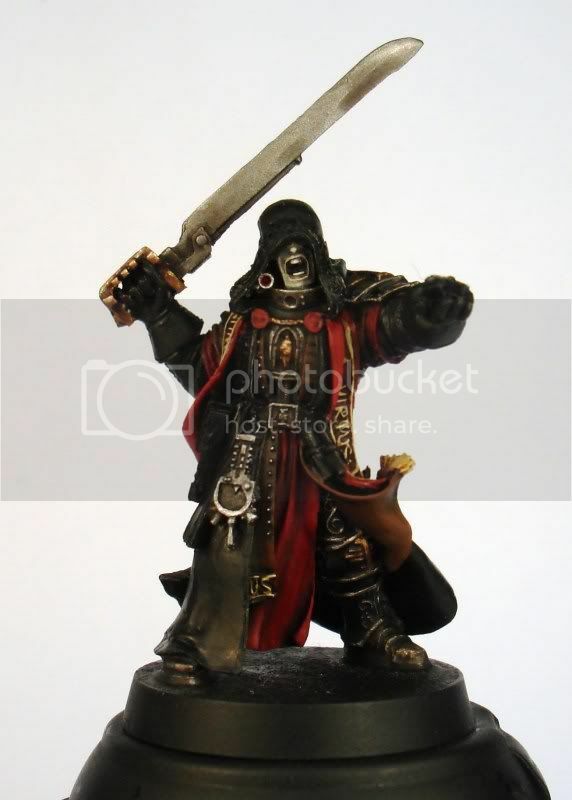 He suggested using dark metal armour, deep red on the sashes and a black coat - a more evil use of the classic Inquisitor colour palette which would contrast with the skin well. Made a bit of headway on Adorno, the first of the Inquisitors. I wanted to go for quite a dark scheme throughout, only using brighter spot colours. Strangely enough, i've gone with red. Funny that. Quite pleased with the face on this guy, again built up with washes and glazes over an Astronomican Grey basecoat to tie him with the Daemonhost. Considering the amount of detail on this guy im quite a way through him - only major area left is the coat then it's all detail work. As much as i'd like to say i'd finish him today, it'll probably be monday/tuesady. And at last, painted pictures of Adorno! A truly awesome inquisitor that. Thanks, guys! It's always nice to get some replies. I can definitely see the Palpatine connection! 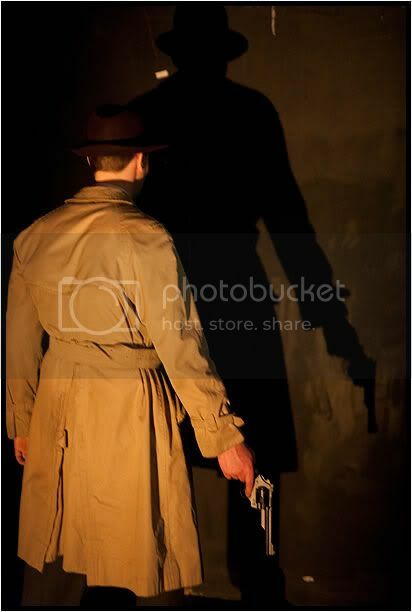 The pale skin was supposed to help enforce his connection to Seraphael. Steve's taken a break to work on some of his Plague Marines, but after that he said he'd be working on the true-scale Space Marine I made as a GM-used "Weapon of Mass Destruction". I've always liked that daemonhost conversion. the normal daemonhosts are just such terrible models, but you've managed to turn one into something that I'm actually jealous of. Congrats. Thanks, Ynek! I take that as quite the compliment. 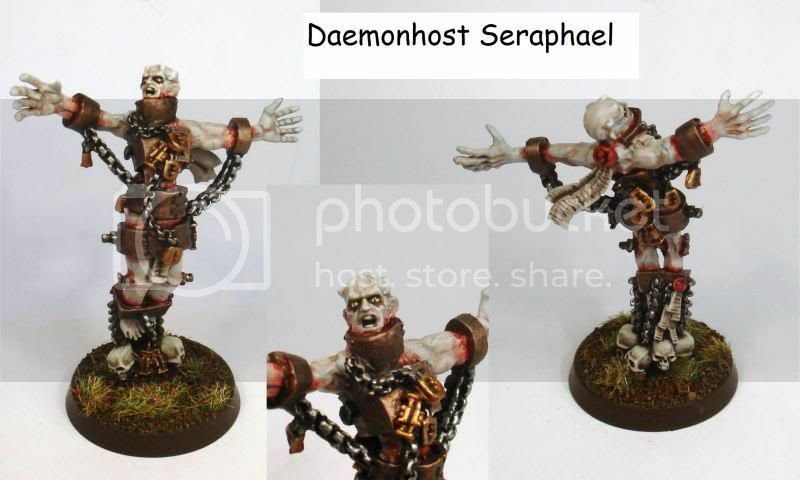 I agree that the Daemonhosts are terrible models. Quite a few models in the 40k range were inspired by their 54mm equivalents, but whereas some of them turned out pretty well (the Death Cultists are nice, I think) the Daemonhosts are terrible. My next goal is to try to produce a decent-looking 28mm Arco-Flagellant! 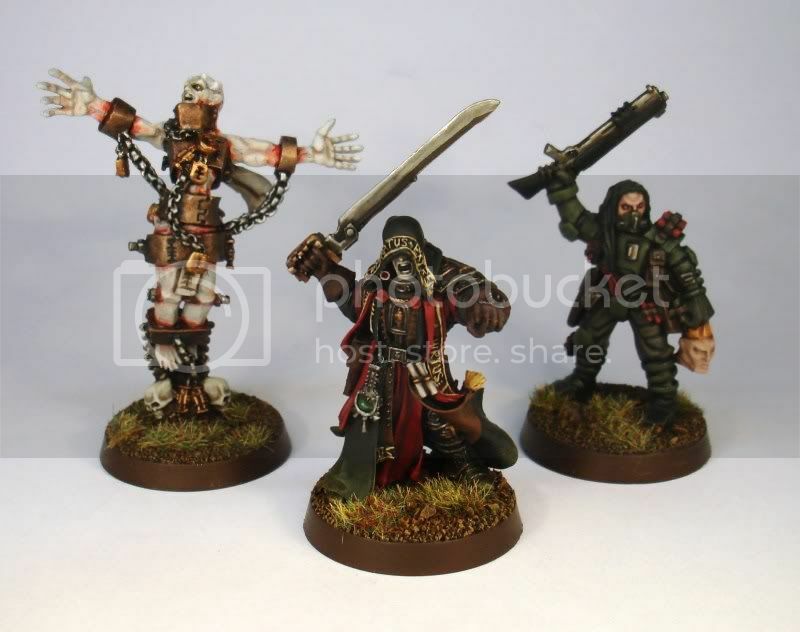 I want to be clear that I really like all these models - Adorno and the sage especially - but does anyone else find it slightly ridiculous that the bounty hunter is holding a cleanly severed head despite wielding a shotgun and, as far as I cal tell, not carrying a blade of any kind? That's going to be a great party though.